One of the pleasures of cycling in France is riding through the country's vineyards, full of grapes ready to be made into wine - a staple of French culture and dining, of course. Last week we got an email from our friends at Château La Tour de Chollet, who you can visit on one of our Bordeaux cycling tours. They've had a good quality harvest this year, so it's the perfect time to book a cycling vacation for next year so you can pick up one of their signature wines! Just a quick update and some photos of the merlot and cabernet franc harvest. We picked yesterday, the 26th September, a few days earlier than normal, despite the first 2 weeks of September being unseasonably cold and and wet. The weather was cool and dry, perfect picking conditions. As expected the yields are down, at 50% less than last year - but most importantly the quality is good, with the early analysis showing excellent grape maturity, with good levels of sugar (potential 13.5% alcohol) and acidity. As shown in the photo above we pick the red grapes with a harvest machine (our neighbour's). This allows for speedy picking, and the new high tech machine also removes any stems so the grapes are in great condition when they arrive in the chai (winery). Please scroll down to see the rest of the harvest explained in photos. Just a quick reminder that as well as our current range of wines - the 2011 prestige (just 50 bottles left, so be quick if you want some more! ), the 2014 classique, the 2015 blanc sec exceptionnel and the 2016 rose - we have released the last few cases of the wonderful 2010 classique - visit our online shop or drop us an email to order. 1. Harvest started at 6am - we start before sunrise so that the grapes are safely in the tank whilst it's still cool, reducing the risk of oxidation and allowing easier temperature control in the wine making process. 2. The harvest machine straddles the vine and shakes it. Ripe grapes are like any other ripe fruit, if you shake the tree the fruit falls off. 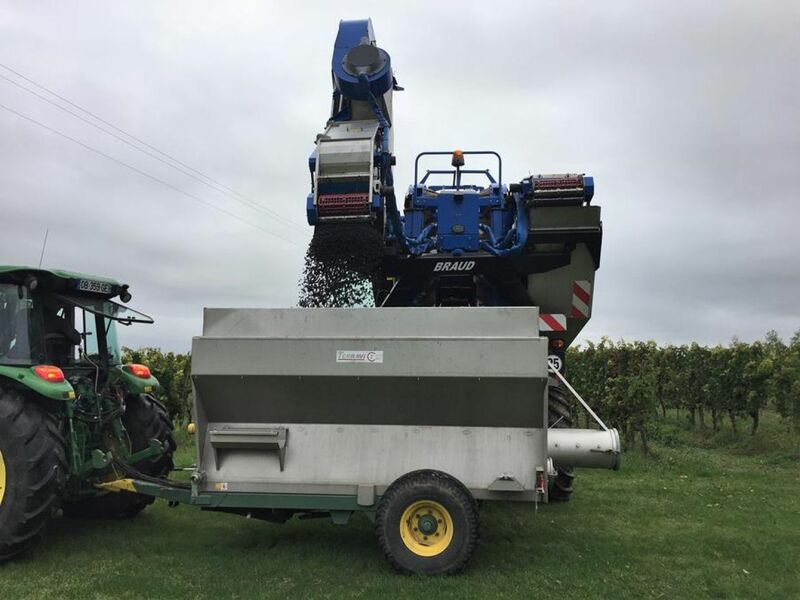 The machine then removes the stems, and the grapes are collected in panniers. 3. When the panniers are full, the grapes are tipped into a waiting trailer and taken back to the chai. 4. Our vineyards surround the property so the transportation only takes a couple of minutes. 5. The grapes are then pumped directly into the tank. 6. This is the view from the top of the tank. The object in the bottom right is a guard that stops the tap from being blocked by the grape skins. 7. The free run juice collects in a compartment at the bottom of the harvest trailer and is pumped into a different tank. 8. The juice is left to settle over night to be added back to the skins the following day, this allows us to remove any heavy matter. 9. This photo shows the merlot grapes in the trailer. The next stage is the wine making. After a few days of cold soaking, the sugar to alcohol fermentation starts, followed by removal of the skins and then the malolactic fermentation. 10. This is what is left on the vine after the grapes are picked by machine. After the harvest the job is finished for the vines for this season. Pruning begins in December and the vines will put out new shoots in March for the 2018 vintage. French Cycling Holidays' tours for 2018 are now open for inquiries and booking; we have Bordeaux riding tours running from May through to the end of September, available now.